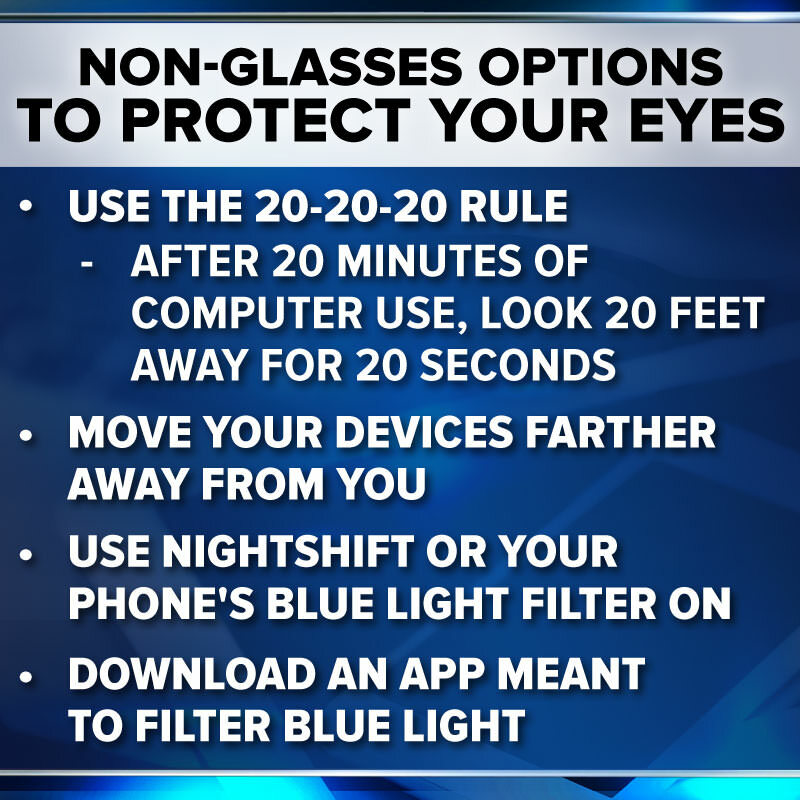 If you use your phone, watch TV or scroll on your iPad more than two hours a day you're constantly taking in blue light and it could be damaging your eyes. Some doctors call it "light pollution," because even though we need blue light to see the color blue, some types cause big issues. It might be a headache or sore eyes that tips you off, but blue light can also make it hard to sleep, with potentially cancer-causing effects. Do you spend more than two consecutive hours a day in front of a screen? "I'm staring at my phone, my TV, my tablet, non-stop all day," Dalton Hayes told the I-Team. He said he used to have red marks on his eyes from the strain, but didn't realize what they were from. Then his girlfriend got blue-light glasses. He tried them on. "I was looking at my phone and watching tv at the same time," Hayes said. "And I noticed it really did make a difference in my sleep quality that night." It's because of the way blue light interacts with your body. "Blue light suppresses your Melatonin, which is what tells you to go to sleep," explained Jessica Minette from Metro Eye. She said blue light goes into your retina, the part of the eye that helps you see, and weakens the tissue. She said the more blue light you take in, the higher your chance of eye-related diseases. She says your best chance is to protect yourself like you would from UV light from the sun. We tested out different kinds of blue light glasses. We found a $9 pair on Amazon. The listing said it takes out 30 percent of blue light. "It is going to reduce it quite a bit, but my concern there is that it's mostly color and not actually the damaging rays," Minette said. Minette described the eye's aging process, in which we develop a yellow-ish coating to protect from blue lights. Now, there are glasses lenses made to mimic that process. Minette said they filter out about 45 percent of harmful blue rays. She also tested out a clear lens meant to block harmful blue light rays. She said those block about 12 percent. She said anti-glare, or computer, glasses are often billed as protection. And, while she said they can help prevent too much eye strain, they don't block blue light. But some research indicates glasses might not always work. A study published in a British publication for ophthalmologists shows there isn't enough evidence to prove blue blocking glasses work. Still, Hayes thinks they're worth it. "If I would have tried them out first and they were several hundred dollars, I probably would have still got them. It definitely makes that big of a difference," he said.